I recognized the Brahms playing in the small cafe, which immediately recalled to mind the memory of the music store I worked at while at university. Something about the lilting melody stirred within me an appreciation of beauty tinged with a deep, almost overwhelming loneliness. I took a bite of my chicken salad sandwich. A young woman walked past my table with a soft blue rag in her hand. She went from table to table, wiping away crumbs. We were the only two people in the cafe. She gave me a small smile, the perfunctory greeting of a service industry employee. But behind it, I sensed her melancholy. Something about the young woman told me that she did not belong here. And then I realized that I did not belong here either. We were two people, strangers, who somehow found ourselves on two different paths, and at some point these paths crossed each other in this little corner sandwich shop. I contemplated this as I munched on some kettle chips. The Brahms built to a steady crescendo. 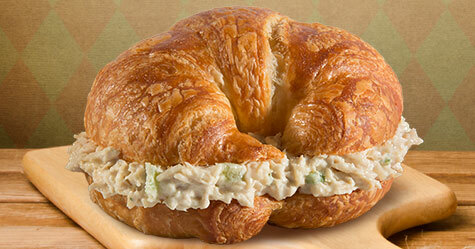 I let myself revel in the beauty of the music as I enjoyed my chicken salad on a buttery croissant. Finely sliced celery gave it a satisfying crunch, and a layer of bean sprouts complemented the creamy mayo. I appreciated the delicate balance of flavors and textures, dancing together much like the treble and bass notes of the Brahms piece. As I ate, I caught a glimpse of my reflection in the glass of the cafe’s window. I was startled to see that my reflection was not eating a sandwich. In the glass, my eyes looked dark, my expression grim. Although my reflection wore the same crisp button-down shirt as I did, he stared back at me, his arms at his sides even though mine were holding the croissant in front of my mouth. I watched the version of myself in the glass. He seemed to be staring past me. It is then that I remembered the girl in the cafe. I saw her reflection appear in the glass next to mine. Her lips seemed more plump, her expression more sultry, than she had appeared before. I turned my head; the real life version of the girl was still wiping down tables, oblivious to her reflection. In the glass, I saw the dark version of myself grab the girl roughly and begin to kiss her. She hung limply in my reflection’s arms but did not seem to be fighting it. Instead, she gave herself over to the savage demands. My reflection tore off her apron, much to my horror. The girl’s mouth parted in an o, as if she longed for the brutish force of the man in the mirror. And yet, her eyes remained vacant. She was giving in to her loneliness. I could not bear to watch any more of this scene. I felt sickened; the chicken salad roiled in my stomach. I jumped from my chair, the croissant still in my hand, and burst through the doors of the cafe, away from the glass window. As I stood on the street, trying to make sense of what I had just seen, a gray-striped tabby cat walked up the sidewalk, its tail twitching. Its eyes, two green orbs, focused on me.